It could be something out of a Disney movie, but it's real life. 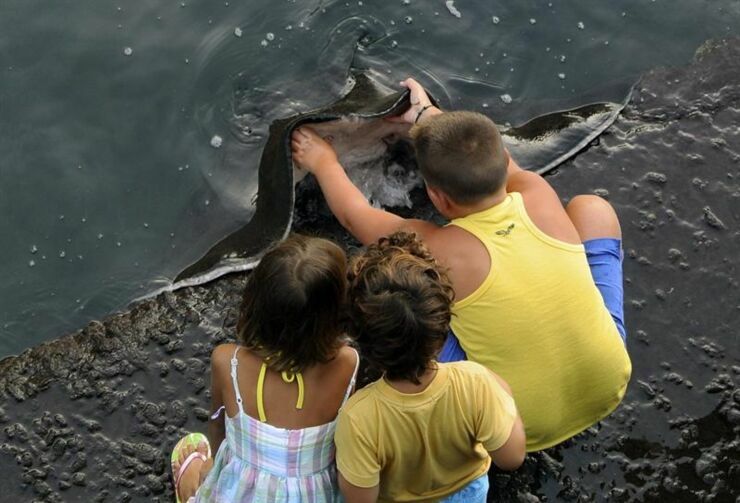 On the island of La Gomera, part of Spain's Canary Islands a little boy hand feeds a huge stingray which comes to visit him at the habour. This unusual friendship started because local fishermen throw some of their catch back into the water in the port of Vueltas at Valle Gran Rey. The discarded fish attracted various marine life to come and feed off them. One of the visitors is a large black stingray who comes right up to a little boy called Joel and takes the fish right out of his hands. According to website SportFishingLanzarote.com the stingray is called Sebastian and has a wingspan over five feet wide and weighs around 150 kilos. The site says that because stingrays have good hearing Sebastian associates the sound of the fishing boats approaching with food, so heads on over for his lunch when he hears them. One of the first fisherman to feed him was a man called Fernando Barroso. "For Sebastian, Fernando says that one day he was fixing black mackerel when the ray jumped into his hands, and scared him, but it stayed still at his feet so he could touch it and it seems that even he understands." says SportFishingLanzarote.com. "Even now there are other fish beginning to follow the example of Sebastian, as Pablito a Mantelina ray, they are modest ones that rise to the surface, eat and run." The site also mentions that Sebastian has now become a tourist attraction, but all the people taking photos can scare him. However the little boy Joel, who is Fernando's son, is the only one who can touch the ray, he even calls him over by splashing in the water. Someone needs to turn this into a Pixar movie, stat.